The country total is starting to mount up for this tour; Albania is number 17! I’ve climbed over 1,000m on each of the last 3 days, and regularly well over 500m for the last 9, with one day exceeding 1,500m; the Croatian Coast is not for the faint-hearted, but it’s worth it. Today I left Dubrovnik behind, after a good day off, and pedalled South East. On my way to the border with Montenegro I tried to use up my remaining Croatian Kuna; I did quite well, buying food and replacement toothpaste shampoo etc, but then found another 100 Kuna stashed in my panniers, so I’ve got about £20 worth left for next time I visit! There was quite a queue of traffic waiting at the border, but I bypassed most of, pulling in beside some Austrian motorcyclists just before the checkpoint; hello’s duly exchanged. Once in Montenegro the roads seemed to get a lot busier, and the driving more erratic. I don’t know in which countries it’s illegal to drive whilst on your mobile phone, but people have been using them all along the Dalmatian coast; makes me nervous. I’m also getting irritated with coach drivers, who all pass far to close for comfort. I know they could give me more room as I don’t have the same issue with lorries. I cycled along the coastline around to Kamenari, where I could have got the ferry across the narrow stretch of water to the other side of the bay, and avoided an additional 25km haul, however I decided it would be for more pleasant to take the scenic route around to Kotor. It proved a good decision, with lots of small villages and some fantastic scenery. It looks like a lot of it has been redeveloped for the tourist industry, but it’s all been tastefully done, and hasn’t spoilt the bay. I loved Perast, where there were quite a few English people on holiday. I stopped for a break and an ice cream. Once I reached Kotor I had to pedal through a long tunnel (1.6km), which was a nasty experience due to the traffic, fumes and dust. It did however cut out a long climb, and I made it through unscathed, joining the road to Budva. Budva is a big tourist town on the Montenegrin coast, and is supposed to have a ‘kicking’ nightlife, not that I was likely or wanted to see it. I stopped at the tourist info on the way in and asked about campsites; they directed me to an open one, rather than the one I had intended to go to which was closed. I found Avala camping, which was a bargain at €6 a night, and set up. It’s a bit of a noisy campsite, as it’s next to the main road, but has a supermarket just next door, decent wifi, and a friendly owner. The only drawback was there were no convenient trees for my hammock, however I can’t be lucky all the time. For some reason my tan lines are uneven Do I have one shot leg longer than the other? I grabbed some food and a few cold beers from the supermarket, then relaxed. Convincing Lobster to pose for a still life with the beer and cycle tour festival bottle was tricky, however bribery with chocolate always works. The Niksicko beer, although sounding unappealing, was very refreshing, and pretty similar to the others beers I’ve been sampling down the coast from Slovenia. I do miss a pint of ale though, and am looking forward to visiting the Fat Cat pub in Norwich when I get back, for several; think it just won an award for good beer again, brill. One night only in Montenegro, then it was on to country number 17, Albania. I was keen to lay my fears to rest over what awaited, having been quite anxious about the route and where I’d be staying. Things almost always work out one way or another, with camping, wild camping, hostel or hotel opportunities, and people seem to live successfully in all these places, so what exactly am I worrying about?! From Budva to the border wasn’t a particularly long way, however the road decided to go up & down all available hills along the coast, which proved pretty taxing. I stopped to buy a few supplies, and to get some more Euros out just in case ATMs aren’t working in Greece; could be handy in Albania too. To get to the border I had to turn inland, and climb up a fairly long pass, through some picturesque Olive groves and farmland, before descending to Albania; I stopped for an ice cream before crossing, just to keep energy levels up. I had the best greeting of the tour to date as I entered Albania; high fives from two children on the other side, waiting by the roadside. Pretty neat and something that would repeat itself several times over the next day or two. As I cycled along I noticed the cars were all a lot less expensive looking, aside from the tourist ones (Italian, Dutch and German mostly). There were also quite a few mopeds with large trailers attached to their fronts, transporting all sorts of things from whole families to farm goods, and in one case a bed; they looked a bit rickety to me. There are more modes of transport on the roads in Albania; cars, lorries, motorbikes, bicycles, combinations thereof, horses & donkeys, with or without carts etc. Everyone appeared really friendly, with lots of smiles and hellos; I lost count of the number of people who shouted hello today. Could Albania be the friendliest country so far? I briefly diverted to Shkodër, a big town not far from the border, to withdraw some Albanian Leke, then continued South to Bushat, turning off the main road and heading for Camping Albania in Barbullush. I ended up missing the turning as I was too busy looking at Albania life going on, so had to back track, adding about 6 km on to my ride. Camping Albania is a good set up, with a large restaurant and swimming pool, and decent toilet block, and a grassy field to pitch in, bliss! Unfortunately the restaurant was closed due to a wedding, however that gave me the opportunity to visit the village and grab a few supplies; basic stuff but fine for dinner – bread, cheese, jam, crisps and a couple of cold beers, with sardines and a tinned couscous salad added from my panniers, a veritable feast. Lovely to pitch on some grass, comfy! Four Dutch camper vans turned up around the same time as me, so I spent some time chatting with them, before doing some planning; campsite has wifi, but it’s a bit intermittent, especially with the power cuts that kept happening. I think I’m heading for a hostel tomorrow, after what’ll be a long ride to Ebalsan. There aren’t any campsites on route until I get to Lake Ohrid, the day after tomorrow, and there don’t appear to be that many in Greece either, so there may be some wild camping coming up, however I’m more likely to go for a cheap hotel or hostel as I really value a shower at the end of the day, and that extra bit of peace of mind. As I closed shop for the night the sky was being illuminated by flashes of lightning, quite along way to the North, and the wind was getting up. Could be in for a rough night so I deployed the guy ropes. Next update could be a few days away, depending on wifi. This entry was posted in Albania, Montenegro, Self Propelled 2015 and tagged Adventure, Albania, Bicycle Touring, Bike, Charity, Countryside, Croatia, Cycle Touring, Europe, Expedition, Montenegro, photos, Self Propelled 2015 on September 6, 2015 by SelfPropelled. I don’t mind admitting the last few days have been quite tricky. It’s not so much the cycling, which whilst demanding is still very enjoyable, it’s more the thought of what is yet to come. I’m slightly anxious about the route to Istanbul, through Montenegro, Albania, Macedonia, then into Greece and Turkey. I know it will be fine, as loads of people have cycled it and I keep reading blogs about how great it is, however I won’t be 100% happy until I’m there and pedalling it. In fact I can’t wait to get to Albania etc and lay my fears to rest. I’ve just made it to Dubrovnik and am going to have a day off to do some prep work, and have a rest, before the ride to Istanbul which will take another 12 to 14 days. Getting out of your comfort zone is a great thing, but can be challenging when a bit of fear sets in, and you have too much time pedalling to dwell on risks that aren’t going to materialise! I think this is one of the challenges of cycling solo; if you’re pedalling with someone else you have a companion to mull things over with, and to share responsibilities on route, risks, food, accommodation, money etc. Anyway, as I get closer to Montenegro I’m getting happier about what is yet to come, and am looking forward to more adventures. Routes and stats for last day of August, and 1st day of September below. It seems amazing it’s September already, however thinking back it does feel like a long time ago that I set off from my house in Norwich. 102km pedalled today, and it’s definitely getting warmer again; it’s especially hot where the road cuts through a canyon, or an artificial cut through with rock on either side, and no breeze – can get sweltering! Morning swim anyone? Watch out for the sea urchins! Breakfast on a Croatian beach, as the sun comes up, is definitely something I can recommend, with a few early morning swimmers getting the day off to a good start, and people readying their boats. Very peaceful and beautiful. I consumed the dinner I’d bought from Lidyl, but not eaten due to Nordsee camping offering better fare; ham, cheese, baguette and fruit set me up nicely for the ride ahead. I rode off towards Split after bidding Nordsee Autocamp a fond farewell, looking forward to seeing what the coast had to offer today; it just seems to get better, even if it is almost constantly hilly. My first stop was in Sibenik, a moderately sized and old town about 20km away, where I paused for a wander about, and to buy a new charging cable for my iPhone; I ended up buying two just in case, as they only cost a fiver each, which is about a third of the UK cost. Sibenik proved a picturesque town, full of German, Austrian and Italian tourists, as well a narrow streets, charming bars and restaurants, and medieval looking buildings; not sure how old they actually are. As it was already really hot, it would have been rude not to stop for an ice-cream too. I think ice-creams are going to replace my tarte du jour feature, at least for a bit. Re-energised thanks to the well-timed Gelato I cycled onwards, staying on the coast road despite what looked like a short cut inland; would have involved a mega climb so I avoided it. The scenery on the coastline is better than it is inland in any case, with clear turquoise water, yachts sailing slowly about (not a lot of wind), small towns and villages, and beaches with lots of folk enjoying a swim. Saw a few of these signs – watch out for the wild boar! Didn’t spot any though. After a few more hills I made it to the aptly named Marina, where there were lots of Sunsail yachts moored; think it must be the start/end point for flotilla holidays. I stopped for another ice-cream, then at a market to get a few supplies; Croatia is so much cheaper than France and Italy! My destination for the day was a campsite next to Trogir, a largish town with more old medieval buildings, which I forgot to take photos of. The ride down the coast had been wonderful, and I was glad to see it isn’t as yet overly spoilt; there are lots of small towns, and apartments to rent, but no massive hotels and not a lot of building activity I could see. Hope it stays that way. I turned right to the peninsula next to Trogir, and made it to Rozac camping. The campsite was pretty full but they had small spot where I could pitch my tent. I set up and promptly fell asleep in my hammock for two hours; so comfy, how did I manage without one?! After watching the sun go down (it’s getting dark earlier) I had dinner at the campsite restaurant, choosing to enjoy another mixed grill rather than bread and cheese; might not be such opportunities in the wilds of Macedonia. Oh, and I had one of those moments today, when I forgot my towel when taking a shower; realised halfway through. Thankfully, although small, a buff also makes quite a good towel! On to Split tomorrow, and another webcam opportunity, then the road to Dubrovnik. Well done to my boss (TLK) on starting his own UK mini cycle tour; hope the weather improves for you! I didn’t have the best night’s sleep, as my camping spot was next to a road with speed bumps, and consequently quite noisy. It was a nice view of the sea to wake up to though, and I’d been comfy, even if I was a little grumpy due to lack of shuteye. Although tired I had a long way to go today if I wanted to keep to my rolling 200 miles every 3 days target, so I pedalled off from Trogir in good time, deftly making my way through queueing traffic, whilst being careful not to catch any cars with my panniers. I cycled 127km in 7 hours and 11 minutes, with just over 1,000m in climbing, so not bad going. 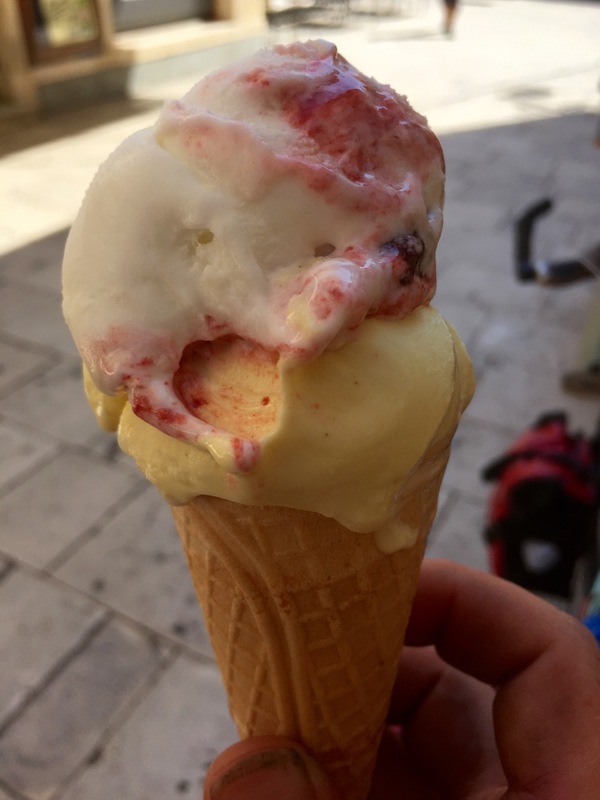 I paused for a break in Split, after only about 30km, riding down to the waterfront to look for the webcam, and to enjoy an ice-cream, which I think I’m getting addicted to; strange as don’t really eat them in the UK, however I guess it’s the right climate for such things here. After waving hello to GCHQ Norwich, and accidentally withdrawing 100 Kuna rather than 1,000 from an ATM, d’oh, I continued on passing through various small towns, and some great scenery. By the time I reached Makarska I was feeling very hot, and pretty tired, so turned off the main road and down into the town for a break. It proved to be a good choice for a pause, with a lovely quayside, lots of expensive boats, and a choice of ice-cream vendors. I reckon it’s a bit of a pricey tourist town, but very pleasant-looking. A park provided a good spot for a sit down in the shade for 30 minutes, to cool off and re-hydrate. Several backpackers were doing the same; a popular spot. I’ve started seeing more backpackers in the last few days, with a lot of people hitch-hiking, or attempting to flag down a lift by the roadside. Hitch hiking seems to be a popular and accepted method of travel in Croatia; I even spotted a sign for an official hitch-hiking waiting spot today! In general hitching a lift is far more common in mainland Europe compared with the UK. 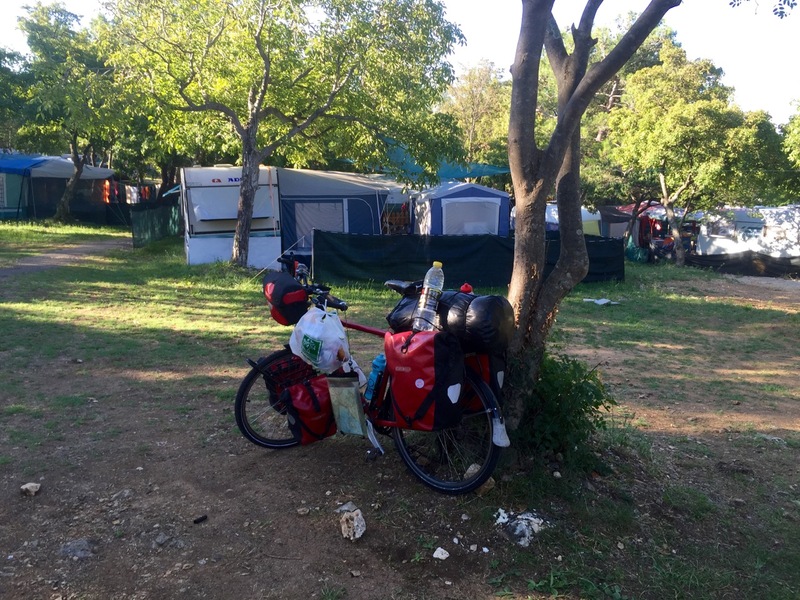 After a welcome rest I pedalled on to Dreverik, then Podaca, over a few final hills before reaching a campsite for the night; Uvala Borova camping near Gradac. Uvala Borova proved to be a much quieter campsite, with lots of space and right next to the sea, so a swim was possible again. I pitched my tent and slung my hammock, then relaxed, easing tired legs over dinner and a few beers from the small campsite market. As usual everyone was really friendly, and although I didn’t have any long conversations, lots of people said hello, and the campsite dog decided to keep me company for a bit; may have been the smell of salami. It as good to have a chat with my brother Will, Louisa and their kids via FaceTime, even if the connection was a bit intermittent. Seb, my nephew, tried to tell me his new joke, about bees, however I kept missing the punchline; he wanted to make me laugh and fall out of my hammock, although that might have been more of his mother’s idea! I did a bit more route research reading up on Albania etc, and stumbled upon the blog of a couple of other cycle tourers who’ve just make it to Albania: http://longhaultrekkers.com/ . I might try to meet up with them if we follow the same route; they’re head of me but travelling more slowly, with a dog in tow; email sent. On to Dubrovnik tomorrow, then probably a rest day; need to do some shopping and have a day off the bike, plus Dubrovnik will be a good place to visit. Wasn’t it the setting for King’s Landing in Game of Thrones? 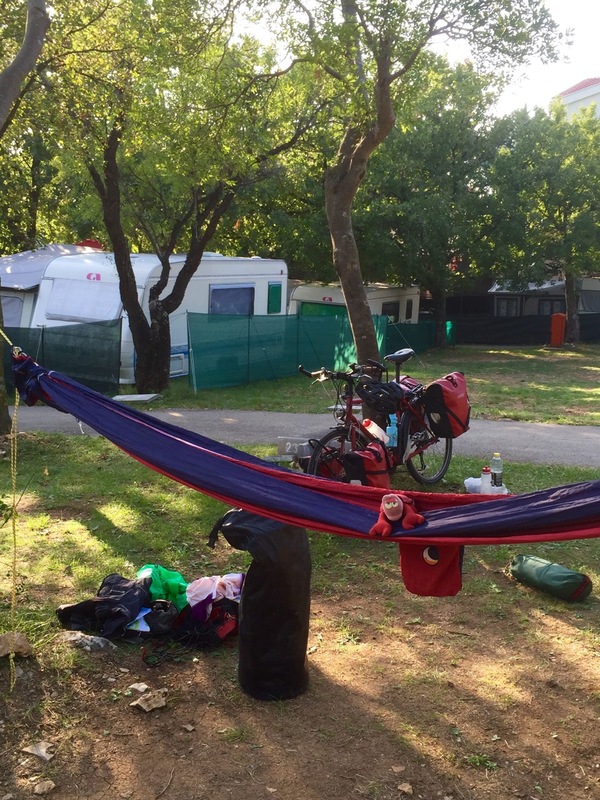 This entry was posted in Croatia, Self Propelled 2015 and tagged Adventure, Bicycle Touring, Bike, Charity, Countryside, Croatia, Cycle Touring, Europe, Expedition, Makarska, photos, Self Propelled 2015, Split on September 2, 2015 by SelfPropelled. Routes and stats for the 29th and 30th below. Cycling down the coast of Croatia is proving delightful, if a little hilly. I’m really enjoying a swim in the Adriatic at the end of each day. At the moment I’m attempting to pedal 200 miles every 3 days, which works out about 110km a day; today was a moderate day, covering 106km, a few of which were on a ferry to the island of Pag. It’s definitely warm in Croatia, with temperatures reminding me of cycling in Spain. I’m used it now, however it makes sleeping in my tent a bit uncomfortable, especially as it’s humid as well. Thankfully I now have my hammock to lounge in, as long as there are adequate trees and no threat of storms; would be a bit inconvenient if a thunderstorm broke halfway through the night! Mosquitoes also seem to have reduced in number, which is a relief, however that could change at any moment so I’m keeping the super-strength repellent handy. I made a good start to the day, waking up early and pedalling off down the coast on the D8 to Novi Vinodolski. The road followed the coastline pretty tightly, with some lovely scenery. The downsides were the traffic and hills, however the first was tolerable and the latter good for the legs. The hills also break up the route a bit, although I don’t want to take on too many big climbs in this heat. Senj – not sure why I took a picture with the carpark in it! After a few bananas, passing through Senj and Lukovo, and past the turning to Jablanac (love these town names), I rode down a steep hill to the ferry terminal at Prizna, to get the boat over to the island of Pag. A lot of tourist traffic had the same idea, with a long queue of waiting cars and a few groups of motorcyclists. The majority of the tourist traffic seemed to originate from Germany, certainly all the motorcyclists, however I also spotted lots of cars from Austria, Slovenia, Poland, the Czek Republic, Hungary, Italy, a few from France, and one from the UK. Seeing what other nationalities you can spot is quite a good way of passing the time, and in this case demonstrates just how many people are descending on the Croatian coastline nowadays. It’s certainly very popular, and I can see why with a beautiful coastline, relatively cheap prices, friendly people and interesting towns. One cautionary note; I’ve nearly been short-changed twice so far, which would have cost me about £20 in total, so worth checking your change carefully if you visit. The more I read about Eastern Europe the more I realise how much it has to offer. There’s so much history, and so many interesting places to visit. If you’re into your water sports the coast has loads to offer, and there is no doubt good climbing and walking to be had further inland. I could spend a few months just touring around the Balkans; think I’ll have to come back! Anyway, being on a push-bike I skipped to the front of the queue, along with the motorcyclists, and had an ice-cream whilst waiting for the ferry, followed by a cold beer just to ensure I was properly hydrated. A road cyclist had the same idea as me, and we both used the cold beer bottle to sooth our hot heads. Once on board I chatted to a few Germain motorcyclists on their way to Montenegro. I seem to run into German motorcyclists everywhere when cycling, from the North of Scotland and all throughout Europe, and now down towards Turkey. They are always good to talk too, and were complimentary, and a little taken-aback, of my pedalling efforts; though I agreed it would be easier on a motorbike. I sometimes have to remind myself that I’ve pedalled a long way, having covered over 6,500 miles so far on this tour, and having seen such a variety of landscapes and weather, from ice and snow up in Scandinavia, to the heat of Spain and Southern Europe. It’s starting to get darker earlier now, so I’m wondering just when it’ll begin to get cooler. The ferry couldn’t take all the waiting traffic, so I was glad I was on a bike for the short 15 minute crossing to Pag; must’ve been about 2km. Pag looked a bit desolate when I arrived, with lots of dirt and rocks, and not much vegetation. There was no shade on the climb over to the other side of the island; man it was hot. I pedalled down to Simuni where I’d spotted a campsite on the ACSI app; it turned out to be more of a resort, and mostly for camper vans or people staying in the chalets, but it had a small if hard area for people to pitch tents on. Thankfully there were a few trees so the hammock was once again a win. I set up, then headed straight for the sea for a swim in the Adriatic; much-needed after a very hot cycle, and good fun diving off the floating platform. The resort was busy, but had a good atmosphere, with several small bars, a few restaurants, food stalls (bought a hot-dog, it was nice) and small markets/tourist shops. I bought dinner from one of the small supermarkets then relaxed in my hammock for the evening, doing a bit of reading up on the countries to come; route looks fairly straightforward but I do need to get a few more maps, hopefully in Dubrovnik, so I’m not reliant on Garmin or my phone. Also need to apply for a VISA for Turkey, but that’s a 5 minute job at some point in the next week. 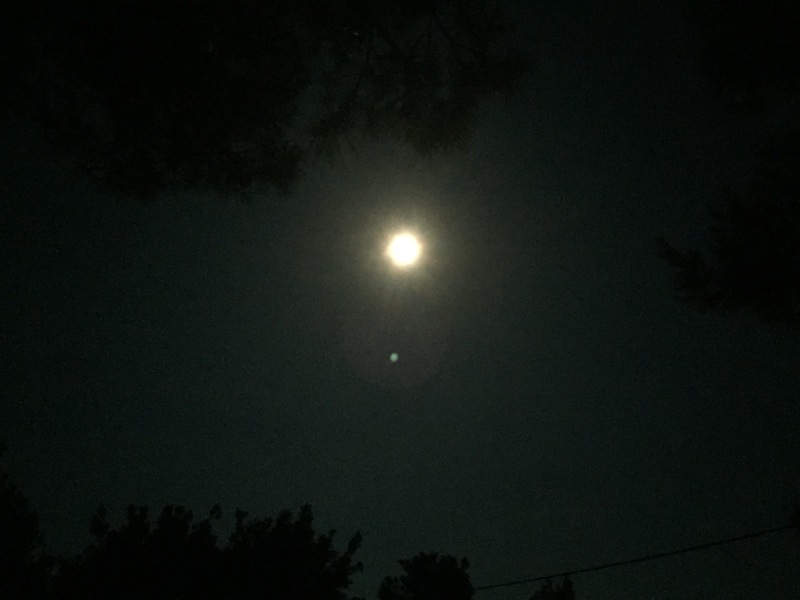 As far as I’m aware…I didn’t get bitten by any werewolves during the night, however I believe I’ll have to wait until the next full moon to be sure. One thing I was sure about was my washing hadn’t dried overnight, in fact it felt wetter; it’s pretty humid at the moment and I think damp washing just absorbs more water. I’m looking forward to it getting a little cooler, and less humid, and to freshening up some of my more smelly bits of kit and clothes; heat + damp + panniers aren’t a good combination; everything just festers a bit during the course of a day pedalling. View from above Pag, looking East; lots of mountains! I left Simuni camping in good time, pedalling up and over to the town of Pag, then down the island towards the mainland. I passed what I think were fish farms, as well as several restaurants with pigs being spit-roasted by the roadside, in big ovens; smelt pretty good. There’s a bridge connecting the island to the mainland at the Southern end, with a nice looking small castle down near the water’s edge. After Pag I turned right toward Zadar, and had to tackle a series of hills before making it to the coast again. I think there are still a lot less hills than if I took an inland route, but I’m not really sure what’s over the coastal mountain range; maybe it’s flat! I need to get hold of some maps detailing Albania, Macedonia, Greece and Turkey, so I can get to Istanbul via the most efficient route, not get lost, and hopefully avoid too many unnecessary mountains. Unfortunately I noticed my back tyre starting to go flat near Zadar, after the bike starting skewing about a bit when going downhill. I pumped it up, but needed to change the inner tube; it could wait until the evening as only a slowish puncture. I continued down the coast, past many an inviting beach with people swimming and snorkelling, or yachts drifting lazily in an idle wind. My next stop was at Lidyl, for a late lunch and to pick up a few supplies. Lidyl has proven a boon whilst touring in Europe; it crops up everywhere, is good value, and has everything food wise you need. 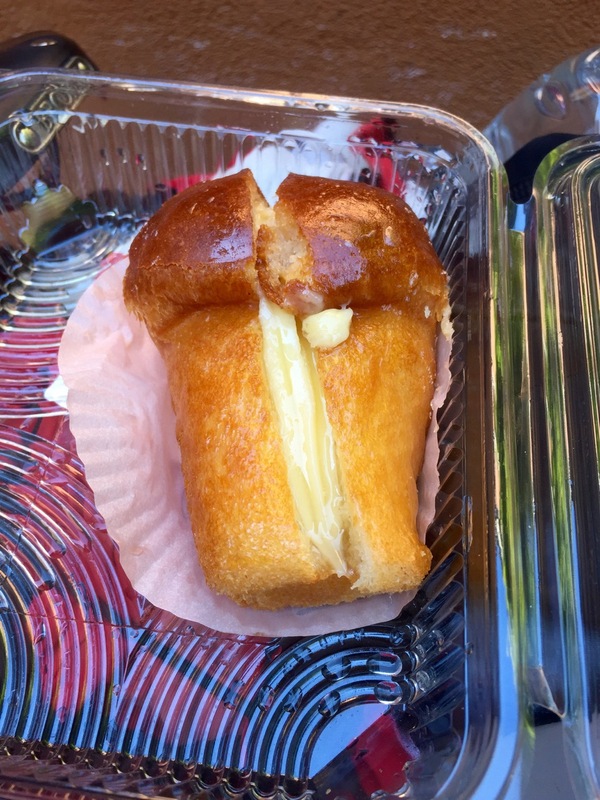 It may not have had a good Tarte du Jour option, but I did pick up a few nice pastries, and an ice cream for good measure. I suspect the supermarkets around here, including Lidyl, are catering for Germain and Austrian clientelle, hence the great Frankfurter sausage roll; seen so many German cars. After a shorter day, covering 97km, I made it to Autocamp Nordsee near Pakostane. I didn’t mind a shorter day, as it’s good to give the legs a break, however I’m trying to pedal 200 miles every 3 days, keeping the total rolling, so I’ll need to put in a longer day at some point. The campsite owner, who I think was probably German, found me a small corner to pitch my tent, and only charged me 50 Kuna, bargain; thoroughly nice bloke. The campsite seemed to be hosting mostly Germans, with a few Croatians thrown in for good measure. Needless to say there was a lot of beer being consumed, and a fair amount of food from the campsite restaurant; I thought I’d better join in. After a cold beer I set about mending the puncture in my rear tyre. I hate mending punctures, and this one was particularly hard work in the heat; sweat was running off me in streams by the time I finished. Unfortunately I couldn’t patch the inner tube, so replaced it with a new one. The puncture was actually on the inner side of the tube, and had resulted from what looked like wear and tear, and a bit of stretch; or maybe the shop pinched it when they fitted it, not sure. Either way it’s mended now and touch wood seems to be staying inflated. The thing I hate most about mending punctures is the doubt that sets in as to whether I’ve mended it properly? Did I pinch the tube, or miss the pin that caused the puncture? Is it going to go flat again immediately? I suspect a lot of cyclists have exactly the same concerns! Hopefully that’ll be it puncture wise for the next 1,000 miles or so. I also adjusted my brakes, then thought I’d better have a shower and least rinse my cycling gear; everything pretty manky after the ride and repairs, including me. I managed to squeeze in a swim prior to the shower, but had to take care to avoid Sea Urchins, which were present in numbers, and a bit like mini mines on the sea bed. Stepping on one is bad news, as the spines tent to break off and are hard to remove. I hadn’t noticed them at first, and don’t have any sea shoes for swimming in, but froze when my big toe clipped one and I noticed I was surrounded. I made it out, still having enjoyed a cooling swim, but had to remove a few splinters from my toe; think I got it all out, but I’ll have to keep an eye and employ vinegar treatment if any of the spine is still embedded; really don’t want an infection to take hold! I decided to eat at the campsite restaurant, and enjoyed a lovely sea view for my meal, with a couple of cold beers to wash everything down. It was a nice atmosphere, and very friendly at the campsite; one to recommend if you’re passing through. Being right next to a beach is also a big win. Needless to say I slept pretty well, despite it being hot still. Tomorrow I continue on towards Trogir and Split. This entry was posted in Croatia, Self Propelled 2015 and tagged Adriatic, Adventure, Autocamp Nordsee, Bicycle Touring, Bike, Charity, Countryside, Croatia, Cycle Touring, Europe, Expedition, Pag, photos, Self Propelled 2015 on September 1, 2015 by SelfPropelled. Couple of fairly big cycling days as I bid arrivederci to Italy, spent a night in Slovenia, and then pedalled over some significant hills into Croatia. Routes and stats below. Today was long day; 134km km pedalled in about 8 hours, so pretty quick for me. After a good night’s sleep at Altanea Camping in Duna Verde, I was ready to try to pedal to Slovenia, albeit with potential campsites identified before the border should I be delayed for any reason; ice-cream stops, beer, beaches etc. I was a bit slow packing up, but got on the road by 09.00 and cycled to Caorle. I’ll have to think about starting earlier again soon as the daylight hours get shorter, especially on my way back to the UK post Istanbul. After Caorle I had to head North to circumvent an estuary. I ignored some signs for the Eurovelo route, which hasn’t really been very helpful for the tour so far. In this case I think it would have taken me down to the coast and then back up again, adding miles on to the day’s ride. The EV routes will be great once they’re properly realised, but they stop and start too much, and for the most part I don’t see signs for them at all. I’m finding it easier just to make my own way, choosing routes that are efficient, and diverting when tempted by something. I joined the SP42, then the SS14 which would take me all the way to Slovenia, with a few quieter country roads thrown in for good measure, just to keep things interesting and avoid the traffic for a bit. Thankfully, although the roads are busy, Italian drivers are for the most part polite and considerate around cyclists, with a few exceptions; one van driver did nearly clip me going through a town, however that can happen in any country, and is probably more likely in the UK. After passing through low-lying marsh and farmland, I made it to Cervignano del Friuli for lunch, and managed to find a Tarte du Jour equivalent. It looks like the ‘Tarte du Jour’ feature might become an infrequent one, depending on availability, however I shall attempt to persevere; need the calories! Today’s tarte was more go a sponge cake, loaded with cream, and alcohol of some description, but lacking a bit in flavour. The alcohol did do wondrous things for easing aching limbs, and made for a relaxed start to the afternoon’s ride. On my approach to Trieste I passed another cycle tourer, emerging from I assume a siesta amongst the grapevines. I’m sure I’ve seen him before, near Nice; he’s pedalling in jeans without a lot of stuff, but making good progress. If I see him again I’ll have to stop for a chat; we waved at each other in any case. Always interesting to hear other people’s stories. As I got closer to Trieste I started to encounter hills again, which actually made for a nice change after the route being flat for the last few days. I started up a big climb and noticed two wolf-like creatures standing guard at the top of a cut through beside the road; they had me going for a few seconds but turned out just to be wolf statues near a war memorial. I’m still worried about danger from dogs when I get into Albania, Macedonia, Greece and Turkey, but have been told by loads of people that as soon as you get off your bike they stop chasing you – think that’ll be pretty hard to do the first time, rather than just pedal faster, might get a big stick just in case! After a nice long descent into Trieste I paused for a break, stopping in the Piazza Unita d’Italia where a webcam opportunity presented itself; I waved to the stalkers at home who duly spotted me. Trieste is a bustling city and port, and there were loads of tourists wandering about, randomly walking out in front of me. I’m sure there’s a lot I could say about the city, however you’ll have to look it up on Wikipedia for more info. One thing – think Trieste used to be part of the Austro-Hungarian empire, and some might still feel it shouldn’t be part of Italy at all, not sure. Not sure what this giant football clock was about; World Cup countdown maybe? After cooling down a bit, and drinking lots of water (it was very hot), I pedalled to the Slovenian border tackling a very steep 150m climb over from Muggia in the process. There was no official border crossing building, but I did find a sign to tell me I’d left Italy and entered Slovenia. For some reason I immediately felt more relaxed in Slovenia. I’m not sure why, maybe the roads were quieter, or the atmosphere a bit sleepier, or perhaps it was because I’d made good progress and passed another milestone. The scenery was certainly picturesque, with the hills very much continuing, lots of grapevines, and a pretty coastline. I stopped for the night at Adria camping (Ankaran), at the bottom of the descent over from Muggia. It’s a big campsite but was very welcoming, and relatively cheap too at €15; long may that continue. After setting up I had dinner a the campsite restaurant, feeling in need of a big meal and a sit down somewhere comfortable; the mixed grill was excellent, as was the sunset. I also met up with a Hungarian family spending a few days in Slovenia; Árpád spoke great English, and had recently returned from working in Ireland. I loved his bright red German van, converted for touring purposes, and it was great to have chat. He mentioned how much he enjoys watching programmes like Coast, Country File, and other BBC productions; made me realise the BBC must do very well out of selling programmes aboard – I guess Top Gear is a great example of that. Tomorrow it’s off to Croatia; I think there might be a few hills in the way first though. I rode 115km today, and whilst the total distance was less than yesterday it felt like more, due to the hills; over 1,500m ascent, which is like climbing Ben Nevis. I left Adria Camping in Ankaran in good time, after saying goodbye to Árpád and family; they were off to see a castle and caves before travelling to Lublianja. Árpád reckons Slovenia beats Croatia from a scenery point of view, however I’ll have to check for myself. I’ve been skiing in Kranjska Gora and it’s definitely a stunning country, and the people very friendly; good for cycling in too as the hobby is very popular, and excellent cycle lane coverage. After a chat about genealogy and how closely related we all are, and about the origins of the Hungarian people (gonna have to read more on that one – they were nomadic originally but settled in what is now Hungary, in the Carpathian basin, as it was the land of Attila the Hun), I pedalled off and up into the hills. Hope the rest of your holiday goes well Árpád, and maybe see you in Hungary! It was a slightly complicated route to get to the right road to the Croatian border, avoiding motorways and the busier roads. After an initial warm up climb, and saying hello to a lot of road cyclists, I made it to the route up into the mountains, and to a climb that rose to about 800m over perghaps 30km, with a few flat bits providing some respite. It was tough going, however the scenery was amazing. I pedalled up to the border surrounded by mountains, valleys and forest, with hardly any traffic on the road. I think encountered about 4 cars before the border; there were more birds of prey than vehicles. At the border I had to show my passport to get out of Slovenia, the first time I’ve used it for border crossing purposes since Gibraltar, however there was no-one stationed at the Croatian post and I pedalled straight into country number 13 (I think it’s number 13 anyway). The climb continued for several more kilometres, through more thick forest, however there were more villages to look at, plus slightly more in the way of people around and farming activity. At one point I passed what looks like a war memorial from the Soviet era, reminding me that this all used to be behind the iron curtain. I finally started to descend down towards the coast again, albeit with the occasional upwards jaunt over more hills as I followed narrow twisty roads, avoiding the main roads. At one point I was slightly startled by the approach of a very noisy engine, as a large and slightly antiquated farm truck appeared and roared past; looked like it might be soviet era itself. I made it to Rijeka and immediately sought at ATM to get hold of some Croatian Kuna; they don’t use the Euro here. Getting cash out was easy as there is no shortage of ATMs, however it’s a shame I had to use my Lloyds debit card rather than my Caxton FX prepaid card; this is the first country I’ve passed through where the currency isn’t available to load onto the card, however they’ll a few more like it shortly. I’m going to withdraw some back up Euro in Montenegro, before entering Albania and Macedonia, just so I have something to exchange or use in case I can’t find a handy ATM. Hopefully the cash machines will be working in Greece! After grabbing a sandwich and a brief chat with 2 German cycle tourers going the other way, I continued down the coast to Crikvenica, through various small towns and ports, and the occasional beach with people enjoying a cooling swim; the water looked very inviting. The hills weren’t done with me yet, with the road continuously rising or falling, hence the 1,500 metres worth of climbing today, and sore legs. I stopped for the day in Selce, just past Crikvenica, at the town’s campsite. 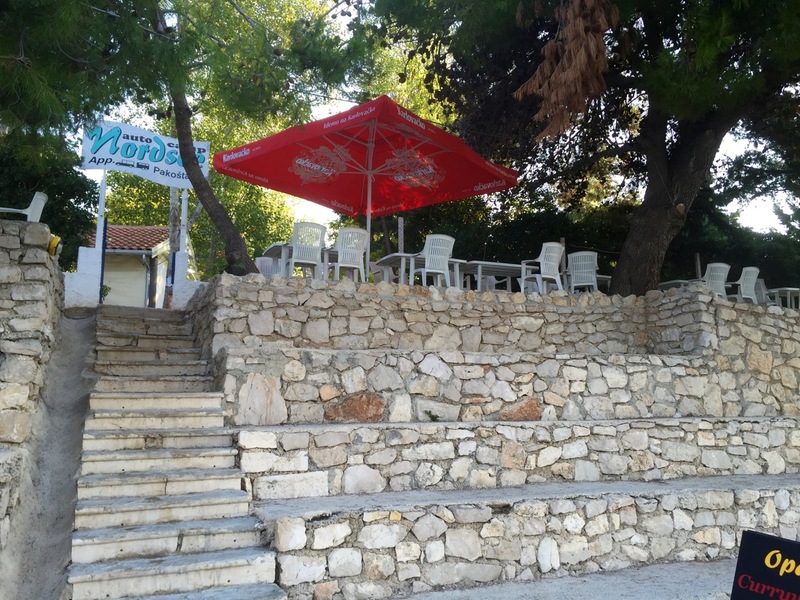 Selce is a small and pretty town, and another tourist hotspot, but tastefully put together. The campsite is decent, with free wifi near reception, and a small supermarket that sufficed for dinner. There’s an on-site bar and restaurant too however all I really wanted to do was lie in my hammock. I could have walked down to the beach for a swim, but there was a risk I might not make it back up again, so I relaxed, read my book, and ate a simple dinner of bread, cheese, ham and fruit with a few beers and some biscuits. It was still hot, reminding me of the conditions in Spain, however the hammock and shade helps a lot; you get a nice draft underneath you in a hammock, which is good when it’s hot, but won’t be so good when cold. Tomorrow’s plan is to continue down the coast and hop on a ferry for the short crossing to the island of Pag, which runs parallel to the mainland and should be interesting. I also need to find a new charging cable for my iPhone, as the my backup cable is now fracturing; the first one went in France somewhere. iPhone charging cables definitely aren’t built to last, however I guess I do stress them a bit when charging my phone from my dynamo; moves cable around a bit. Got to get into the sea tomorrow too! This entry was posted in Croatia, Italy, Self Propelled 2015, Slovenia and tagged Adventure, Bicycle Touring, Bike, Charity, Countryside, Croatia, Cycle Touring, Europe, Expedition, Italy, photos, Selce, Self Propelled 2015, Slovenia on August 30, 2015 by SelfPropelled.